The architectural specifications for wire partitions, window guards, and railing infill panels, can be downloaded below. Click on the ‘+’ icon to expand each option to select the appropriate style system. Browse through the tabs below for product specification and to request a quote. 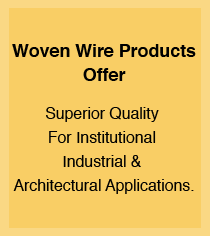 Woven Wire Partitions can be used for a variety of applications and are a cost effective solution for everything from storage lockers and computer cages to barriers, enclosures and partitions, to protect valuable assets and inventory. Heavy-Duty Wire Mesh Partitions are designed to prevent the most extreme threats and ensure maximum security. These extra-tough wire mesh partitions provide greater security and protection in the most demanding environments. Wire Mesh Window Guards offer highly secure protection for windows, safeguarding them from damage, vandalism and break-ins, while having minimal affect on light, ventilation and views.